The US Human Rights Network and the Human Rights at Home Campaign will launch a national call for the Obama Administration to develop a National Plan of Action for Racial Justice March 21, 2013. We will submit an open letter and petition on March 21st calling on the Administration to adopt this comprehensive plan. 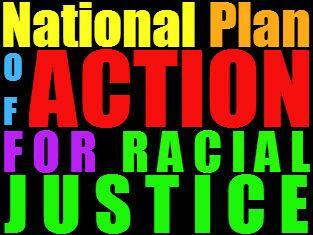 The National Plan of Action for Racial Justice is a comprehensive action plan that would be adopted by the federal government and applicable to all levels of government to address persistent contemporary forms of racial discrimination and race disparities in almost every sphere of life. Our current civil rights laws are simply not enough to advance racial equality and human rights for all. They do not address inequalities in access to healthcare and housing, or address the legacies of racism inherent in immigration law, or law enforcement policies that result in excessive incarceration of African Americans and Latinos. Read the National Plan of Action Educational Resource.